In attack or defense, the German infantrymen were the sinews of every operation. 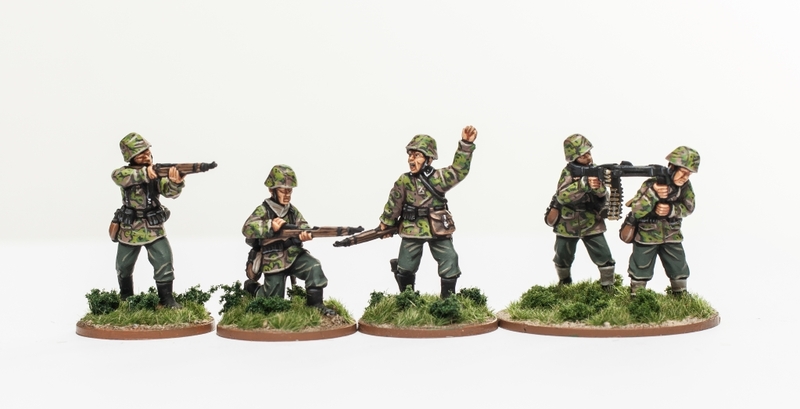 This range lets you field late war Wehrmacht Panzergrenadiers or Waffen-SS infantry in 28mm scale. The troopers fit into the theaters of Russia, Italy and from France right up into the Battle of Berlin. These soldiers are laying down heavy fire to pin down or to destroy the enemy. The machine gunner opens up from a standing position while his assistant stabilizes the weapon on his shoulder, holding the bipod. A rifleman kneels, pulling back the bolt to insert a new clip. Another Panzergrenadier or SS-Grenadier fires his Karabiner 98k rifle from a standing position, while the leader gives a hand signal. The Rifle section firing consists of 5 highly detailed 28mm scale miniatures, containing a MG-42 machinegun. All are made from white metal and are supplied unassembled and unpainted. Glue and paints not included.